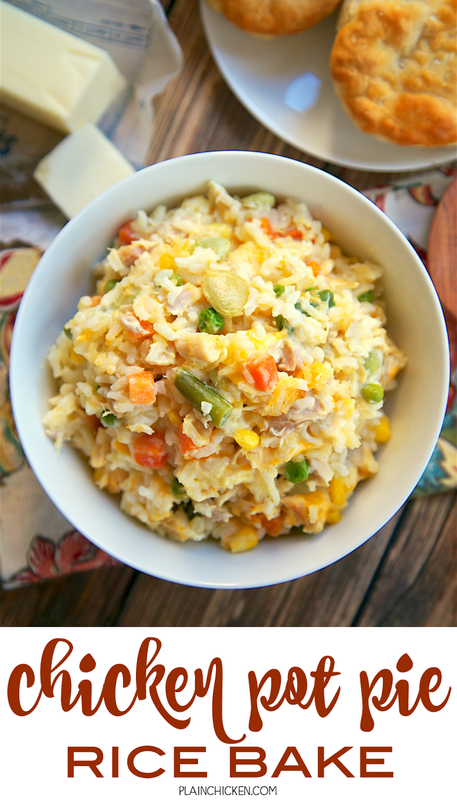 Chicken Pot Pie Rice Bake - chicken, mixed vegetables, cheddar, cream of chicken, sour cream and rice. Ready in 30 minutes! A whole meal in one pan. No need for extra sides!! We love to serve this with some buttermilk biscuits to complete the meal. 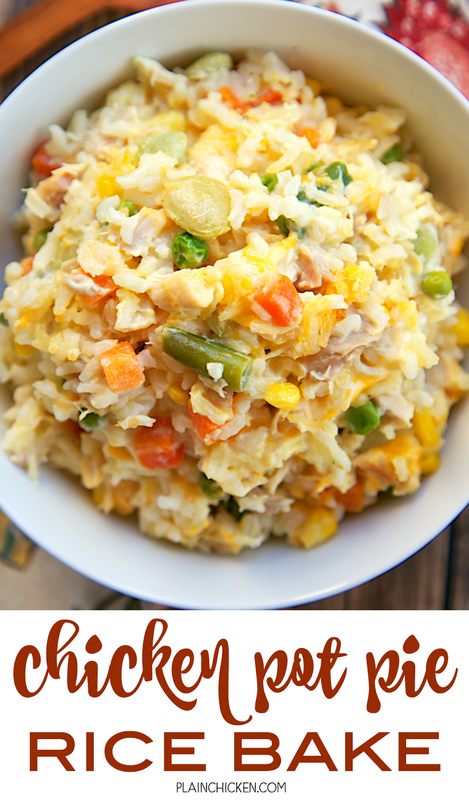 Everyone loves this easy casserole dish! We've really been into making rice casseroles lately. 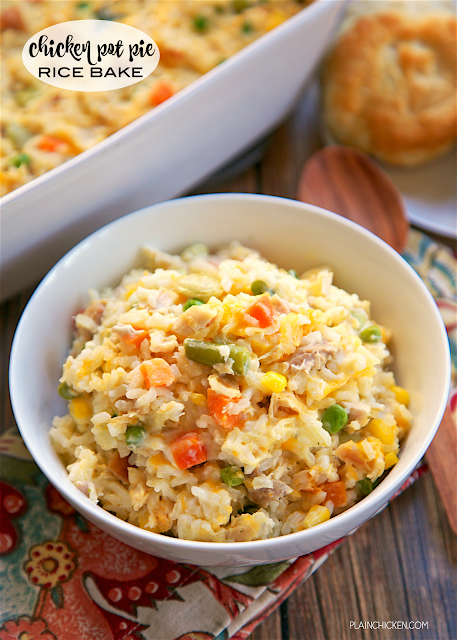 I was wanting something different last week and decided to try my hand at a Chicken Pot Pie Rice Bake. It turned out great! I loved that the casserole was a meal in one pan - chicken, veggies and rice. No need for extra side dishes. Just pop the casserole in the oven and dinner is ready in about 30 minutes. We served this with some buttermilk biscuits. I used instant white rice in this casserole. You can substitute instant brown rice. Make sure to follow the directions on the box. Brown rice has different cook times. You can also eliminate the instant rice and water in this recipe and use 4 cups of cooked rice. Preheat oven to 375 degrees. Lightly spray a glass 9x13-inch pan with cooking spray. Bring 2 cups of water to a boil. Add instant rice, cover and remove from heat. Let sit for 5 to 7 minutes, until water has been absorbed. 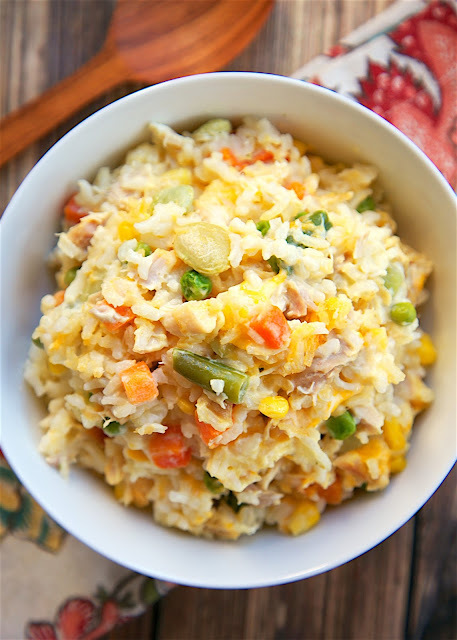 In a large bowl stir together chicken, soup, sour cream, cheese, frozen vegetables, 1/4 cup milk, and cooked rice. Pour rice mixture into prepared pan. Such a perfect weeknight dinner -- especially for my picky kiddos. Adding this to the list!! I love this recipe. Cream of #### soup with chicken and sour cream is so comfy. Thanks for sharing. Do you think you can make this in the crockpot? I want to use uncooked rice though. I don't have sour cream. Can i substitute with something else?? Could I make the rice in a rice cooker and then combine that with the other stuff? I think that would be just fine. Enjoy! Is it two cups of cooked rice or uncooked rice? two cups of uncooked instant rice - you cook it in the first step of the recipe. Enjoy! This is delish! I used a gluten free cream of chicken soup and my entire family enjoyed it. I dont use instant rice, in fact have never seen it here. How much cooked rice does 2 cups uncooked instant rice yield?